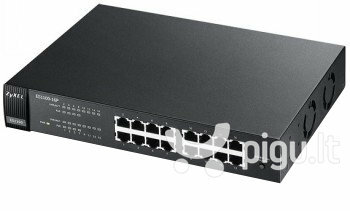 The ZyXEL Switch ES1100 Series is designed for SMBs to boost business network performance and efficiency. It enables businesses to enter the world of networking connectivity without the need for complicated management. The Series provides not only plug-and-play simplicity for high-bandwidth connectivity but also the N-way Auto-negotiation functions to connect its network counterparts with the highest possible data speed as well as to activate the duplex mode automatically. The ES1100 Series is Ideal for typical noise-sensitive office environments for its superior energy efficiency and Ethernet connectivity. The environment-aware ES1100 Series offers 10/100M Ethernet speeds critical to the next-generation network applications, and it also provides power-saving functions to reduce energy consumption for lower operating cost. - The feature automatically detects network traffics and adjusts power consumption accordingly in a dynamic manner. It reduces power consumption during the low link utilization periods. - The power usage adjustment feature automatically reduces power usage when any shut down network device or inactive link is detected. That is, power consumption of the Series can be adjusted according to the link status or the number of active network devices when possible. - The devices equipped with this green feature can automatically detect the length of connected Ethernet cables and adjust power usage accordingly. The shorter the cable length, the less power it consumes.